You have such a beautiful R.V. Centre and it is so immaculate that Marg and I decided to stay at least one more night. This is a beautiful camp site - much like an Alberta or USA site. Great place and we'll definitely be back and so will our friends. Thank you ever so much. The 5 acre River Valley R.V. Park was purposely sized and uniquely designed to accommodate our guests more personably and effectively. 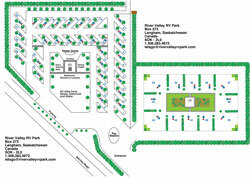 Small does not mean less, our 48-site park boasts its large sites, with ample space for each occupant. All of our sites are now long pull-through or maneuver friendly back-in full service sites, offering 30 and 50 amp service. Seventeen of these sites are new as of 2011. 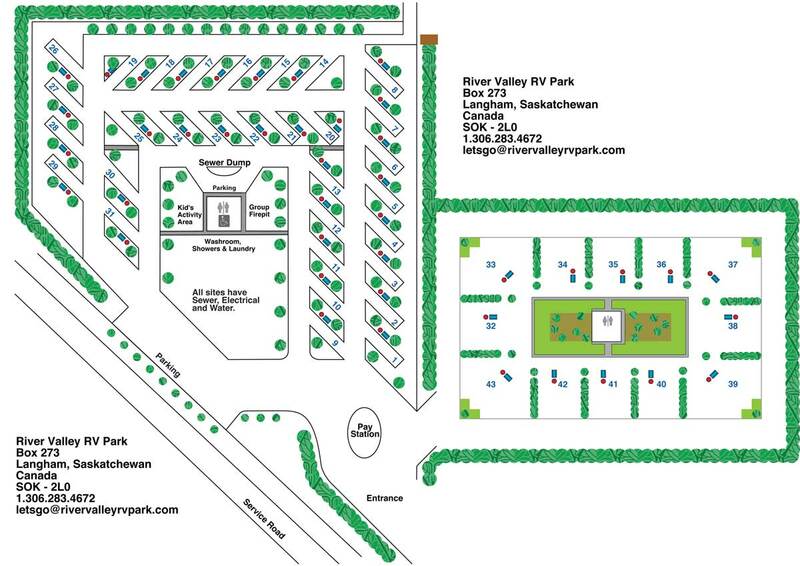 River Valley RV Park is well treed and irrigated, with many flowers planted each year by us and by our patrons. Cement patios and an in-ground fire pit with a heavy duty adjustable cooking grill compliment almost all of our sites, with portable fire pits available to the rest. Picnic tables compliment each site. All of our sites are easily accessible to washrooms, free hot showers and a laundry facility. Large grassed areas can be used for group visiting and games. There is a group fire pit close to the building, where we meet regularly for potlucks, dessert nights, music sessions and other socializing. Kids and grandkids can wear out their energy at the playground, or run through the sprinklers to cool off, as we irrigate the lawn! We want you to feel at home with us here at River Valley R.V. Park. Park amenities that help to make your stay more enjoyable include a dog park, horseshoe pit, pickleball court, lawn games, patio with pergola, and a small clubhouse where you can play cards, table games, enjoy coffee and a visit, or read a book. Our park service building is a big step up from your “normal” camping experience. The beautiful stucco building has a roofed patio out front, and dormer windows to allow natural light inside. You will enjoy the bright flowers before you enter the washrooms or the laundry room. Sit on the outdoor benches and enjoy the peace and quiet as you wait for your laundry to be done. When you step into the washrooms you will be delighted by the classy, modern facility, kept warm with in floor heating for your comfort. Go to our gallery page to view more of our beautiful RV park. The laundry room has three full size coin operated washer and dryer sets, and a long counter space convenient for sorting or folding laundry. There is also complimentary reading material for you to enjoy as you wait, or to take along with you. There is bundled firewood available for a small fee behind the service building, as well as a sewer dump station with running water.